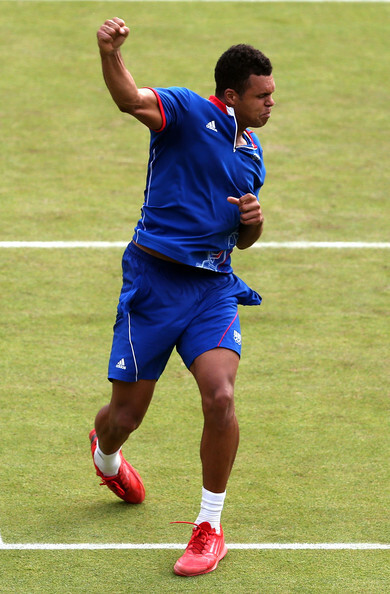 France's Jo-Wilfried Tsonga celebrates after setting Olympic record. Fifth-seeded Frenchman Jo-Wilfried Tsonga completed a remarkable second-round victory over Milos Raonic of Canada on Tuesday at the London 2012 Olympics Tennis Event. Tsonga defeated Raonic 6-3, 3-6, 25-23 in three hours and 57 minutes on Court One. "At the end, I was just very happy for my country," said Tsonga. "I did it for them, and that's it." It was the longest set (48 games) in Olympics tennis history, beating the previous record (38 games) that took place at the 1988 Seoul Olympics in a women’s doubles match, when Canadians Carling Basset-Seguso and Jill Hetherington beating Mercedes Paz and Gabriela Sabatini of Argentina 7-6, 5-7, 20-18. It was also the most games (66) in a best-of-three sets men's or women's match at the Olympics. 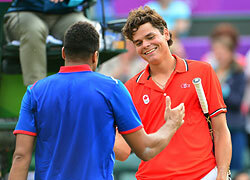 Tsonga hit 17 aces and 60 winners, while Raonic hit seven aces and 76 winners. Tsonga converted two of his five break point opportunities, while Raonic could only convert one of eight. Tsonga committed 27 unforced errors to 40 for Raonic. The match was suspended due to rain at 1:23 p.m. local time, with Tsonga leading 2-1, on serve, in the third set. The encounter resumed at 4:03 p.m. and the deciding set lasted exactly three hours. Raonic saved one match point at 15-16, 30/40. At 20-21, he fell to 0/30 and was forced to save another match point en route to levelling the score. At 23-24, the Canadian dropped to 0/40. He saved one match point with an unreturned serve, but on the next point he was unable to scramble up a Tsonga drop volley. "I think it is something good," said Tsonga. "To have some good matches like this at the Olympics. It's good for tennis, it's good for sports and I'm just really happy with the way I played today." In the the third round, Tsonga will play Spaniard Feliciano Lopez, who used his greater grass-court experience, to beat ninth-seeded Argentine Juan Monaco 6-4, 6-4 in 71 minutes.